Finnish grocery store owner Sampo Kaulanen had an idea. 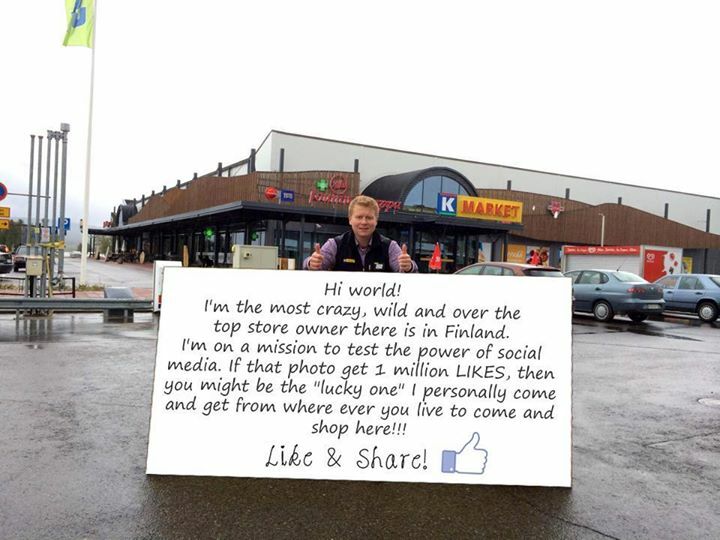 He is trying to get a million likes to his photo in Facebook where he is standing behind a huge sign in the front of his store. The sign says that if the experiment succeeds, one person will be some how selected and Kaulanen promises to come personally pick up the lucky winner to do some shopping in his store in Ylläs, Finland. If you’ve ever wanted to visit Lapland or you think it could be worth to (It is. ), then go to this Facebook photo and hit the like button.